Platforms that combine networking with user interfaces will help companies test post-PC ideas. Connected devices, like the Nest thermostat, have the potential to upset entire product categories. 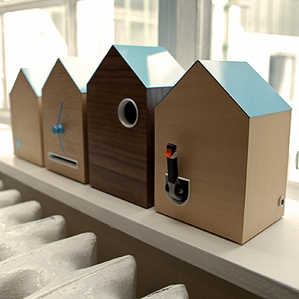 Tweet-o-clock: This clock responds to tweets, as well as mentions and direct messages on Twitter. Why should only computers, smartphones, and tablets be able to send a tweet? 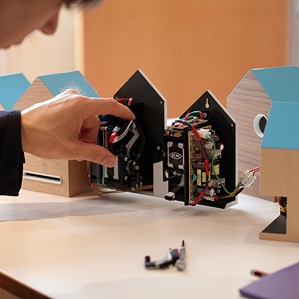 In the hopes of challenging this idea, Twitter recently developed a whimsical tweet-enabled cuckoo clock. It uses a toolkit that could help other designers and engineers test ways for new products to contribute to, and feed on, the social network’s chatter. Twitter created the clock, called #Flock, last month in partnership with London-based technology consultancy Berg; the clock responds to incoming tweets, @-messages, and retweets by animating small wooden puppets. The toolkit made by Berg is designed to make it easier for consumer-tech companies to prototype similar “connected products” and experiment with their novel user experiences. As the cost of networking technology has plummeted and wireless connectivity has become more ubiquitous, connected products have begun to enter the mainstream marketplace (see “Nest’s Smarter Home”). The concept of the “Internet of things” first emerged in the late 1990s. It proposed that physical objects not normally thought of as “computers”—like boxes in a warehouse or appliances in a home—could be networked together using small, cheap digital transmitters and receivers. But according to Berg CEO Matt Webb, the basic engineering challenges of connecting physical objects to the Internet are still too daunting to encourage rapid innovation. “Our ambition is to let you go from zero to your first connected product in a day,” says Webb. “We all cut our teeth developing for the Web, and we wanted to create a way to experiment with hardware that’s just as agile.” The Berg Cloud dev kit includes two small circuit boards and microcontrollers with access to a set of Web APIs, allowing the microcontroller to send and receive data from Internet applications. Another device in the kit, called a Bridge, provides wireless connectivity, and a built-in mobile user interface called Remote can access, manage, and control the system via iPhone, Android, or Windows Phone devices. Berg Cloud is specifically designed to make it easier for companies to scale up their connected-product experiments. User-management tools in the kit’s firmware allow for managing multiple customer accounts, as well as analytics for understanding the user-experience patterns that emerge. Another tool, called Sandbox, allows multiple Berg Cloud Bridges to establish an ad-hoc wireless network for testing connected prototypes “throughout your office or campus,” according to Berg’s website.